Elegant Rochees is famous name in custom tailoring. We are dedicated to providing our customers with best quality products and services that are available in the market these days. Complete customer satisfaction and timely delivery are our prime concern. Sunder & Kishore Daswani are the key people behind Elegant Rochees. Their continuous dedicated efforts for last 38 years have brought Elegant Rochees to a position, where it is respectfully know for its exceptional quality and elegant style, not only in USA but in other countries also. The Daswanis believes in long-term relationships with their clients. The number of repeat orders that Elegant Rochees gets from its clients is true index in support of their business philosophy. We have long list of satisfied customer. Their words about us are our aspiration and greatest business asset. Elegant Rochees has been one of the leaders in providing custom-made clothing to corporate America since 1969. Our representatives travel around the country to take orders for custom-made suits, shirts, slacks, sport coats, and jackets. We offer a unique way to purchase custom clothing at reasonable prices while maintaining excellent quality, service and selection. Our experienced representatives will guide you through the selection process from our large fabric selection of over 1,000 suit/shirt/slack fabrics. Upon selection of fabrics, the representative will take your body measurements to ensure a perfect custom fit. Each order is then sent to Hong Kong where our expert tailors will craft each garment specific to your measurements. We are able to offer these low prices because you are purchasing directly from our factory in Hong Kong. NO OTHER TAILORS CAN BEAT OR MEET OUR QUALITY AND LOW PRICES. WE GUARANTEE IT. 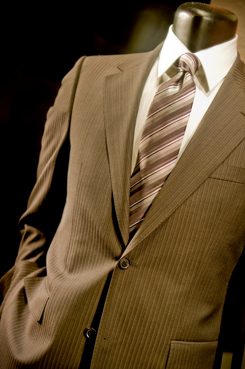 Our hand-tailored suits are fully lined with sweat-shields, heel guards, elastic waist-bands, etc. Hong Kong is a free port so we are able to offer you the largest choice of finaest fabrics. Our expert fitters take 15 measurements of your body and pictures of your posture to ensure the best fit. After the garment is delivered, should you still need minor alterations, we will make the appropriate adjustments. A personal representative in your city is available to provide consultative services, measure and finalize the order at your place of business. Noticeably less than readymade shirts of similar quality sold at popular high end department stores. The middle man is eliminated thus allowing the savings to be passed on to you. With over 1,000 fabrics and colors available, the selections far outnumber that of any department store. The design options of a Unique custom shirt is virtually unlimited.